Japanese instrumental post-rock outfit Mono recently revealed a globe-trotting fall tour schedule, but noticeably absent is a stop in Iceland. Why noticeably, you say? Well, the band apparently have a thing for the country, as evidenced by the scenic new video clip for the group's "Legend," off their upcoming LP For My Parents. 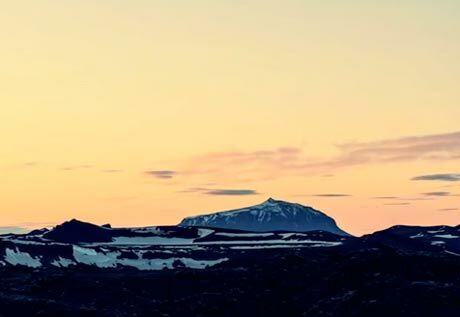 The track's string-and-guitar-trill soundscape clocks in at a mighty 12 and a half minutes, which means a lot of Iceland's gorgeous terrain is covered in the clip. Of the many sights, which are filmed in glorious time-lapse shots, the Henry Jun Wah Lee-directed video showcases sprawling rock-and-moss masses, picturesque waterfall scenes, awe-inducing mountain ranges, jagged crystal icebergs, and more. Someone call Iceland's tourism board, because we just found them a new commercial. As previously reported, For My Parents will be released September 4 by Temporary Residence.